ABBEY'S BOOKSELLER PICK ----- Like many a girl of my schoolyears, I learnt embroidery and needlecraft. I can probably still do a row of chain stitch, or whip over stem stitch, or sew french knots if I had to, but mostly I remember being rapped over the knuckles for my untidy work... So if you told me I would enjoy a book about the social, emotional and political significance of sewing, I might have looked at you askance! But this book transcends my expectations and prejudices, and is one of those literary treasures you want everyone to know about. Divided into chapters such as Power, Frailty, Connection, Protest and Place, this is a journey through the ages and various societies, full of fascinating, revelatory and engaging stories and anecdotes that beg to be shared. Did you know that embroidery was done around seams and openings to protect the wearer from devils in certain Asian cultures? That WWI veterans were encouraged to needlework as a form of successfully managing what we now call PTSD? That women in medieval times might have done the work, but only men could be in the powerful guilds (embroidering vestments for priests was a richly rewarding business). That Mary Queen of Scots embroidered as a form of declaring her status and power, despite her long captivity? A history of sewing and embroidery, told through the stories of the men and women, over centuries and across continents, who have used the language of sewing to make their voices heard, even in the most desperate of circumstances. From the political storytelling of the Bayeux tapestry's anonymous embroiderers and Mary, Queen of Scots' treasonous stitching, to the sewing of First World War soldiers suffering from PTSD and the banner-makers at Greenham Common, THREADS OF LIFE stretches from medieval France to 1980s America, from a Second World War POW camp in Singapore to a family attic in Scotland. It is as much about identity, protest, memory and politics as craft and artistry. 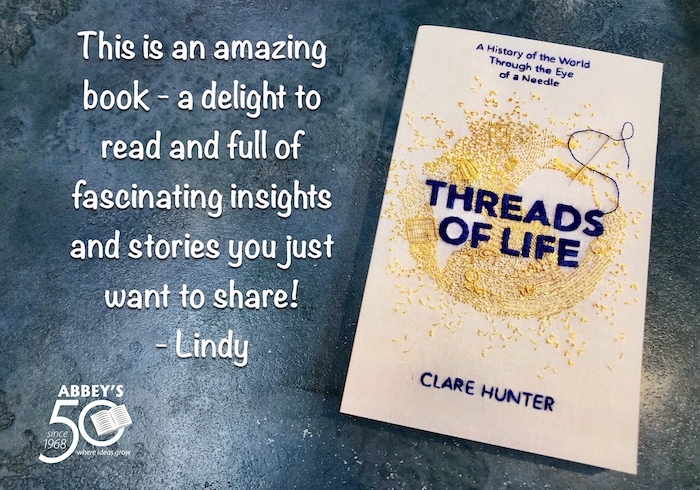 In an eloquent blend of history and memoir with a unique understanding of craft, Clare Hunter's THREADS OF LIFE is an evocative and moving book about the need we all have to tell our story. Clare Hunter has been a banner-maker, community textile artist and textile curator for over twenty years and has established the community enterprise NeedleWorks in Glasgow. She was a finalist for the Aesthetica Creative Writing Award, and had a story published in its 2017 Annual. She was also a recipient of a Creative Scotland Award in 2016. Threads of Life is her first book.